Home / automated election / bgc passion fest 2010 / C2 / C2 drink / election / krispy kreme / philippines / subway / Celebrate freedom, VOTE! I know how stressful this day to other people, that includes all the candidates who are running for a position, so before we loose our faith and energy from the looooooong lines that's been waiting for us in our poll precincts, here are something good to look forward after voting. 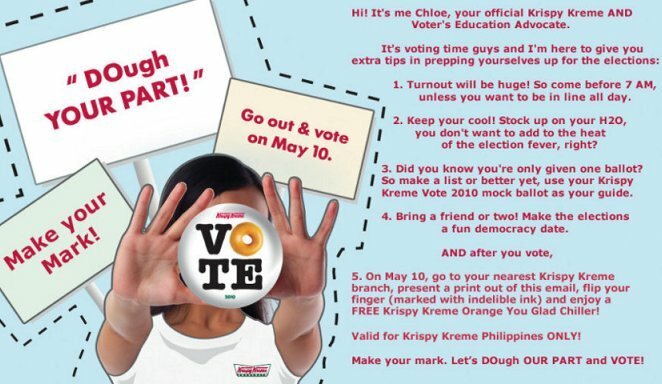 Krispy Kreme's DOugh YOUR PART! 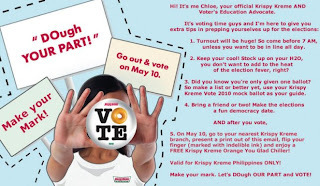 After voting, you can go straight to any Krispy Kreme outlet, show your finger with an indelible ink and present your e-mail from Krsipy Kreme to claim your ORANGE YOU GLAD YOU VOTE doughnut! Subway offers a B.O.T.O (Buy One Take One). 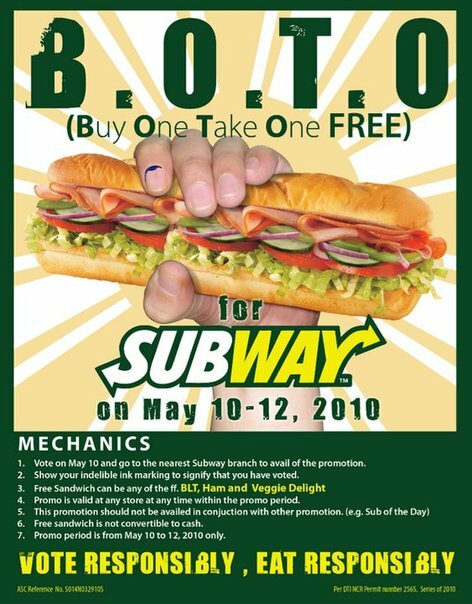 After voting, you go straight to any Subway outlet, show your finger with an indelible ink to avail of this promo. And to cool the tension of this year's election and the summer's heat, C2 offers a Php10.00-price to all flavors of C2 500ml. These Php10.00 drink are available in all 7-Eleven and Ministop outlets. 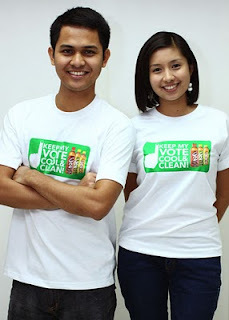 So, chillax, think wisely, vote wisely, follow your heart and may this FIRST AUTOMATED ELECTION be a successful event! Go out and vote! Every vote counts!